Powell River is a city on the northern Sunshine Coast of southwestern British Columbia, Canada. Most of its population lives near the eastern shores of Malaspina Strait, that part of the larger Georgia Strait between Texada Island and the Mainland. With two intervening long, steep sided fjords inhibiting the construction of a contiguous road connection with Vancouver to the south, geographical surroundings explain Powell River’s remoteness as a community, despite a relative proximity to Vancouver and other populous areas of the BC Coast. The city is the seat of the Powell River Regional District. Town millworkers chartered the first credit union in British Columbia in 1939. Prior to the establishment of any settlement in the area, the area was inhabited by Coast Salish peoples, and was used as a landing spot for gold prospectors coming from Vancouver Island who were treading their way to the Fraser River to find quick fortune prior to the creation of the Cariboo Road. The river was named for Israel Wood Powell, who was at that time superintendent of Indian Affairs for BC. He was travelling up the coast of BC in the 1880s and the river and lake were named in his honour. The pulp mill was started in 1908, with a corresponding townsite company town commenced in 1910: the first roll of paper was produced in 1912. Similarly, large logging companies had earlier moved in to take advantage of the huge timber. Brooks, Scanlon & Obrien; Bloedel, Stewart and Welch; and Theodosia Logging were but a few logging companies, with the Brooks brothers and M.J. Scanlon forming the Powell River Company, western Canada’s first pulp and paper mill. The Historic Townsite was designated a National Historic Site of Canada in 1995, recognizing the exceptionally well preserved early 20th Century planned community, rooted firmly in the Garden City Design Movement and the Arts and Crafts philosophy. When the British Columbia Credit Unions Act was passed in 1939, a study club organized by local millworkers secured the first charter with a deposit of $48.30. The mill provided a small office space at very low rent in the early years. 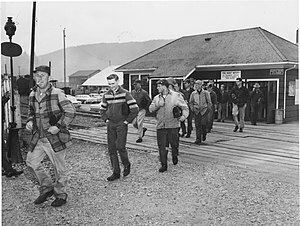 By 1955, when the Powell River Credit Union (now ‘First Credit Union’) moved into a permanent office, it had over 3,000 members and $1 million in assets. The mill in Powell River was at one time the largest pulp and paper mill in the world. In its prime, one in every 25 newspapers in the world was printed on paper from the Powell River mill. However, since then it has significantly cut back on production and now produces newsprint and specialty papers for Catalyst Paper. The mill is down-sizing, and only 3 paper machines (#9, #10 and #11) remain in production, thus laying off hundreds of employees. The subsequent diversification of the local economy led to an increased focus on ecotourism and the arts, in addition to more traditional resources like mining, fishing, and general forestry. In recognition of its strong arts and cultural programs, Powell River was named a “Cultural Capital of Canada” in 2004. The Powell River area is the traditional home to the Tla’Amin nation of the Mainland Comox branch of the Coast Salish peoples, who still reside there to this day in their traditional village site, which is named Sliammon (the usual English adaptation of Tla’Amin). While not on an island, Powell River is accessible to vehicles only by ferry, in fact a sequence of ferries for most of the rest of the continent; the surrounding inlets (fjords) banked by mountainous terrain have made roads to other areas of the BC mainland thus far unfeasible. BC Ferries serves Powell River from Comox on Vancouver Island to the west, and from the Sunshine Coast to the south east, via a route from Earl’s Cove near Skookumchuck Narrows. Since the Sunshine Coast is similarly isolated from the rest of the BC mainland, vehicles traveling from Vancouver must take two ferry rides to reach Powell River (across Howe Sound and the Jervis Inlet if travelling via Sechelt, and across Georgia Strait twice if going via Nanaimo). Powell River is also accessible via plane, either private or via Pacific Coastal Airlines, which offers 20 to 25 minute flights between Powell River Airport and the South Terminal of Vancouver’s International Airport. The City of Powell River includes the original Townsite, as well as the more populous Westview, and the Cranberry and Wildwood areas. On October 15, 2005, coinciding with its 50th anniversary of incorporation, Powell River was officially designated a city. Powell River had a population of 13,165 people in the 2011 census, which was an increase of 1.6% from the 2006 census count. The median household income in 2005 for Powell River was $46,777, which is below the British Columbia provincial average of $52,709. Powell River is situated within a temperate rainforest, Coastal Western Hemlock biogeoclimatic zone. On average, the CWH is the rainiest biogeoclimatic zone in British Columbia. The zone typically has a cool mesothermal climate: cool summers (although hot dry spells can be frequent) and mild winters. Mean annual temperature is about 8 °C (46.4 °F) and ranges from 5.2 to 10.5 °C (41.4 to 50.9 °F) among the CWH subzones. The mean monthly temperature is above 10 °C (50 °F) for 4€“6 months of the year. The mean temperature of the coldest month is 0.2 °C (32.4 °F) and ranges from -6.6 to 4.7 °C (20.1 to 40.5 °F) among the subzones. Mean annual precipitation for the zone as a whole is 2,228 mm (87.7 in), and ranges from 1,000 to 4,400 mm (39.4 to 173.2 in) (and probably more in some areas). Less than 15% of total precipitation occurs as snowfall in the south, but as much as 40-50% in the northern parts of the zone. A regional campus of Vancouver Island University is located in Powell River. The Powell River School Board, School District 47 Powell River operates eight schools which includes Brooks Secondary School (high school), James Thompson, Henderson, Edgehill, Grief Point, Kelly Creek, and Texada (elementaries) as well as Westview Learning Centre. Other elementary schools in the region include Ecole te du Soleil 9 (French School), Assumption Catholic School (K-9), and Powell River Christian School. East of Saltery Bay a powerline crosses a fjord on a span of 3.1 kilometres (1.9 mi).